Last week the UK media put a lot of effort into reporting on the EU ban on the sale of the most powerful vacuum cleaners and then extended the discussion to possible future action on other high end appliances that consume a lot of energy, such as powerful hair dryers, kettles, toasters and so on. This was also in a week when there was an extraordinary amount of other news to report on as well, ranging from ISIS to celebrity photo leaks, so it wasn’t as if they were short of content. 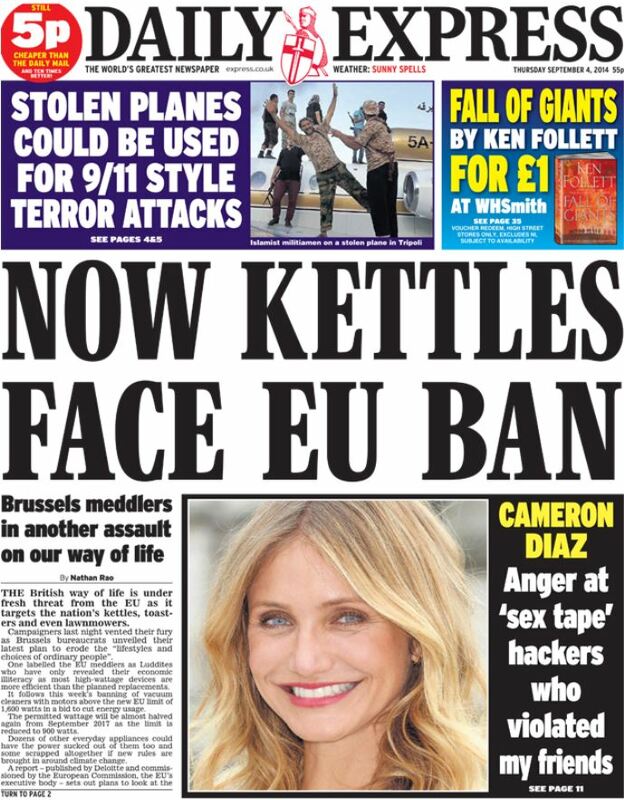 Yet kettles seemingly won the day. Some media outlets were just outraged at the broader idea of Brussels interfering yet again, but others began a discussion about the effectiveness of the measure, with The Guardian resorting to the headline “Will banning high-powered kettles and hairdryers help climate change efforts?”. The intention behind the legislation stems from the EU Energy Efficiency Directive, which in turn is part of the 20/20/20 for 2020 package – i.e. 20% reduction in GHGs, 20% renewable energy and 20% improvement in energy efficiency. The package aims to meet a number of energy related policy objectives, but the big three are climate, competitiveness and security of supply. Unfortunately it isn’t quite this simple. While using energy more efficiently may well improve EU competitiveness and, provided there is no domestic efficiency driven rebound, might even lower the dependence on imports, the impact on “climate change” will likely be zero. This is because of the “stock” nature of the carbon dioxide problem in the atmosphere and the scale of energy demand globally. Nevertheless, there is the notion expressed by many, that as efficiency effectively drives down local energy use (e.g. in a household or factory), mandating efficiency must be part of the policy mix to reduce global carbon dioxide emissions. Efficiency is a vital part part of economic growth, but it’s relationship to carbon dioxide emissions is much more complex. I have written about this many times before and perhaps the explanation that I keep returning to as to why people accept the above notion is an examination of the Kaya Identity, which although correct in its presentation of carbon dioxide emissions in the economy leads to a flawed conclusion as to what to do about them. The International Energy Agency (IEA) followed this line of thinking in their 2013 report, Redrawing the Energy-Climate Map. Like many others, they projected what business-as-usual emissions would be by 2020 and then argued that a focus on energy efficiency could reduce this, effectively claiming an emissions reduction. Nevertheless emissions continue to rise. This reasoning appears to show energy efficiency as the most important contributing factor to change, yet in reality the original projection represents a situation that may never have occurred. The economy requires improvements in energy efficiency to drive growth, which is why efficiency is so important, but that doesn’t mean emissions reduce in the sense that the eventual load on the atmosphere is impacted. If energy efficiency really is a route to a lower concentration of carbon dioxide in the atmosphere, then it needs to pass one clear test, i.e. which known fossil fuel resource will be left in the ground (or a proposed extraction project shelved) because of this? Only then are cumulative emissions potentially impacted, which is the real driver of the climate issue. One unintended consequence of energy efficiency policy can be to exacerbate the emissions problem. In the worst case scenario, an energy efficiency improvement in the power generation supply chain can incentivize the resource holder (e.g. coal mine) to expand the resource base and therefore increase the potential tonnes of carbon that will be released into the atmosphere. Efficiency mandates have had both positive and negative consequences over time. In many instances they have spurred innovation, leading to the introduction of new products and also reducing the cost of energy services. Air conditioning is a good example, with innovation spurred by programs such as Japan’s Top Runner approach. But this has also made air conditioning much more affordable and therefore more widely available, which in turn has resulted in enormous demand for airconditioners, more settlement and development in hot arid areas and therefore more energy use. This efficiency drive has offered huge benefits to society, but one of them has not been to help manage the accumulation of carbon dioxide in the atmosphere. In the USA, the introduction of tough CAFE standards for vehicles in the 1970s and 1980s was partly blamed for the rise of the SUV or light truck. As these were not covered by the standard, they offered a loophole for both the manufacturers and their customers to have larger vehicles without having to invest heavily in new technology to make them more efficient. The vacuum cleaner mandate is already having a perverse effect. There is a rush to the shops to buy a powerful machine before they vanish, which rather undermines the whole effort . . . . . . So they want to impose a sort of austerity on people to meet an efficiency target, seemingly not understanding that they already have a cap in place. Imposed efficiency won’t help meet the cap unless it is implemented in response to the C price. The question seems to me at what point do they impose enough mandates such that they lose the public support for doing anything to benefit climate? A long convoluted argument of double talk. If you don’t use the energy in the first place you don’t need to burn fossil fuels to make it. The Europeans get it, The Americas don’t. Hi there any chance i can have some pictures to see the property since im still in uk and moving there in 3 months?